The place was definitely hipster, from the decor down to the staff... and that doesn't work for an old fart like me. 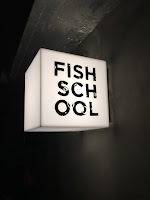 Most of the staff wore white lab coats, and more than a few had ink on their arms... prompting ILove Lubutin to take out her fountain pen and draw a few fishies on her arm. The menu comes on a stainless steel clipboard that weighs entirely too much for no obvious reason. Someone remarked that the skinny wine coolers looked like marble urns that you put ashes in, and in any case they are pretty useless when it comes to chilling wine. And we collectively complained about the decibel level. Does the music really need to be this loud? 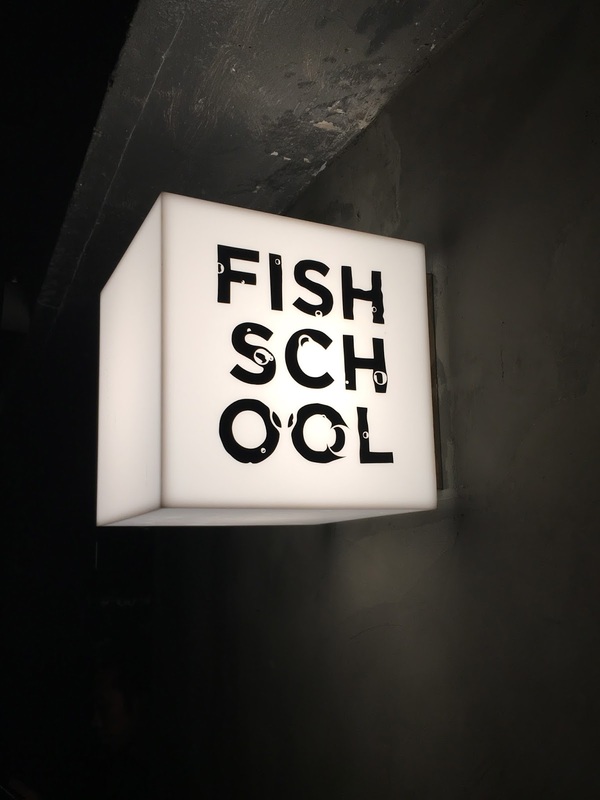 At some point it starts to resemble a bar or a night club, not a restaurant where one expects to carry on a decent conversation with fellow diners. Anyway... enough bitching about the place itself. I went to the kitchen to greet The Man in the White Tee Shirt, and he was pretty excited about the fish he had reserved for us as our main course. The starters would be a combination of things that we ordered and dishes that he felt we should have. Mantis shrimp popcorn / cured duck yolk - anything deep-fried is automatically pretty good in my book, and this was definitely very tasty. Texture was perfect. The sweet taste of mantis shrimp came through, and the duck yolk flavors weren't too overpowering. Charcoal grilled "day-dried" threadfin - the four-finger threadfin (馬友) was dried/salted for a day, perhaps in a similar preparation as the Japanese ichiyaboshi (一夜干し). A simple grilling over charcoal would do the job. The drying definitely changed the texture of this fatty fish, making it a little more flaky. Very simple, and very yum. Monkfish liver foie gras pressé / aged tangerine peel / roselle - any time I see ankimo (あん肝) on the menu, I simply can't resist. This was interesting as it came with chunks of Chinese aged tangerine peel (陳皮) encased in the middle, which provided not only texture but citrus fragrance and flavors. Served on brioche sticks. The acidity from roselle provided the nice balance, although I never would have complained about monkfish liver being fatty. The texture was just oh-so-smooth. Marinated raw crab / sea urchin / oyster rice - this dish has popped up numerous times on social media over the last week and seems to be quite the darling. I've never been a fan of raw, marinated crab, but I made an exception tonight to eat it. The ingredients were scooped out of the shell and mixed in with the warm glutinous rice. We were told that the flavors were "a little Thai", and it definitely had more of a spicy kick than I expected. Charcoal grilled eel - I normally don't like the ones I see in Cantonese restaurants, because they all taste of mud. This had no trace of mud whatsoever, and the honey glaze on top of the crunchy skin was just the right amount. Heirloom vegetables and herbs garden "gargouiilou" - another one of David's hommage to Michel Bras. This included carrots, eggplants, pumpkin, and plenty of herbs. Sole meunière - so here it is. Our main dish. I jokingly complained that David was so stingy that he served us just half a sole, but the truth was that this was one humongous fish! No, that's not a dessert fork on the side of the plate... This wild-caught tonguesole (金邊方利) apparently weighed more than 4 catties (斤), which was supposedly the largest specimen that the fishermen have seen for a number of years. David told us that he absolutely hated to cut the fish in half, but the truth was that there was no pan large enough in the restaurant to fit the entire fish... so he had to chop it so that it could be properly cooked. Lemon custard / almond / coriander - we joked that this was inspired by the Cantonese dessert of 楊枝甘露, with pomelo and orange on top of lemon custard and grated almond powder. Lemon marigold sorbet / poached plum / roselle - the lemon marigold sorbet was very interesting, and I definitely tasted the floral flavors. Too bad the plums were too hard and unripe. Pumpkin ice cream / persimmon / melon - this was a winner. The pumpkin ice cream was yummy, but the killer was the soft, almost mushy persimmon. The kicker? The medallions of pickled melon. Mango / burnt coconut ice cream / coffee - but the real winner tonight, at least for me, was this. We joked with Felix that, being a gweilo, he must automatically like this dessert because there's mango in it... The flavors of the burnt coconut ice cream - along with toasted coconut - worked incredibly well with the sprinkle of coffee-flavored powder at the bottom. The chunks of mango and the mango sauce just added a little more exotic tropical touches. Other than Felix and I, this is normally not a drinking crowd... so we brought a little less wine than we ended up needing. 2008 Roses de Jeanne Blanc de Noirs Côte de Bechalin - a little warm at first, so it was a little too acidic on the palate but not very crisp. 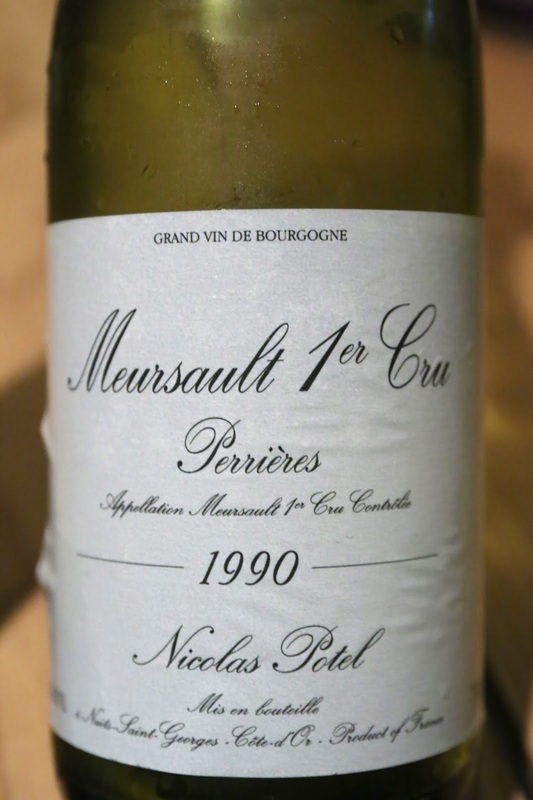 1990 Nicolas Potel Meursault 1er Cru Perrières - opened for more than an hour but nose was still a little closed. A little ripe and round on the palate. Finally opened up nicely after 2 hours, with lemon, toasty oak, and a little sweet butter in the nose. Should have gotten it decanted. 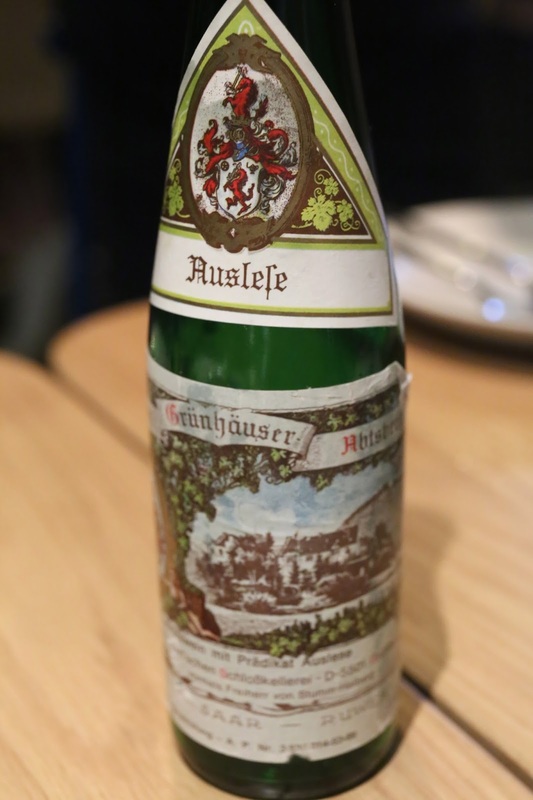 1988 Von Schubert Maximin Grünhauser Abstberg Riesling Auslese, from half-bottle - muscat grapes, white flowers in the nose. Nice balance between the acidity and the sweetness on the palate. Needless to say, we were very happy with the food. Even with all our bitching about the place being too hipster and the music being a little too loud, the minute we took our first bites into the tonguesole, everything else ceased to matter. Yeah, we'd put up with anything just to have something like this again! Thank you, sir... may I have another?